Wen Wei Dance. Made In China, 2015. Photo by Chris Randle. To celebrate Chinese New Year, I went to see Made In China on February 20th, the day after New Year’s Day. It was shown at the Firehall Arts Centre. Made In China is the newest work by Wen Wei Dance. It features: dance by Wen Wei Wang: the artistic director of Wen Wei Dance, and Gao Yanjinzi: the artistic director of Beijing Modern Dance Company. Live music performance by Qiu Xia He, award-winning classical Chinese musician. Live video and sound design by Sammy Chien, an emerging media artist based in Vancouver. As a dance work that reflects multiplicity of social experiences, the piece explores the deep personal memories and life paths of its creators. As I entered the theatre, its stage look caught my eyes: a drum was placed at the downstage center where the Chinese character “生” (pronounced sheng, meaning birth or life) was projected on its surface. Given the stage look and the title of the piece, I had the expectation that Chinese traditional art and personal stories would be revealed in the performance. Unlike most of performances that have scrupulously openings, Made In China started the piece with the four performers walking onto the stage in simplified Han-style (HYPERLINK) clothing while singing a school-themed carol from late 1960s China. Soon after, at the front of the stage, Wang opened up a speech introducing their personal background to the audience. The musician, He, grew up in an arts-loving family and started to study music at an early age, for the most part avoiding the torment of the Cultural Revolution (HYPERLINK). Wang, born in the same city as He, decided to join the army and started his dance training there after the closure of national schools. Both moved to Vancouver in late 1990s because of their artistic background. Gao, who belongs to a minority group in Mainland China, did not experience the impact of the Cultural Revolution significantly, yet still struggled for pursuing a career as a professional dancer. Chien, originally from Taiwan, and currently based in Vancouver as a media artist, specializing in video and sound design. While Wang, Gao, and He stated their traditional heritage as “made in China”, the three performers jokingly excluded Sammy Chien from the group, as referring to the separation of Mainland China and Taiwan. In addition, Wang introduced to the audience about their collaboration process, which he stated firmly that each artist participated in the work as its creator and performer. This work explored their traditional Chinese heritage and eventually built to a contemporary artistic practice. All three have worked with Wang previously. The school-themed carol, the delicate joke with political content, and the generosity of sharing its creative process eventually led to a lively opening that brought laughs to the audience. Over the course of the performance, Gao and Wang presented a series of solos and duets, accompanied with live music by He who was surrounded by a number of Chinese instruments – a pipa (i.e lute), an erhu, a di (i.e flute), a suona (i.e trumpet), a woodblock, etc. 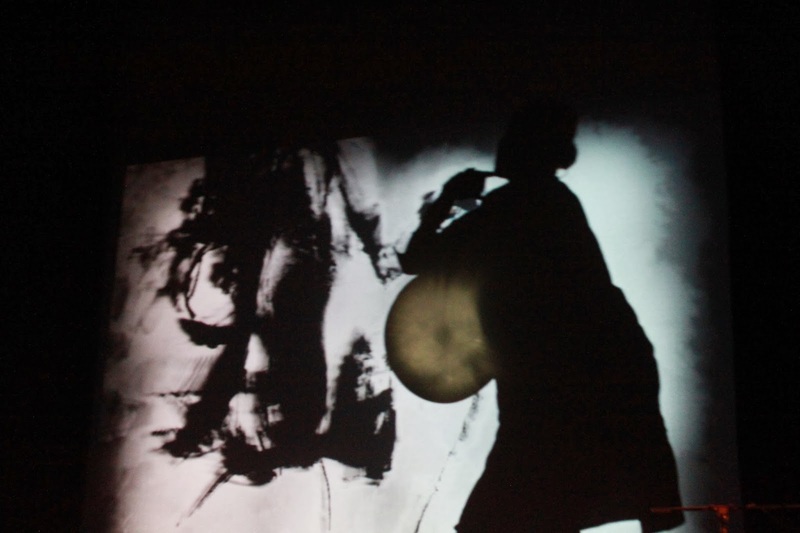 In addition, Chien improvised sound processing and audiovisual through his real-time performance program on stage, where Chinese calligraphy and images were triggered by dancers’ movements and projected on the scrim. 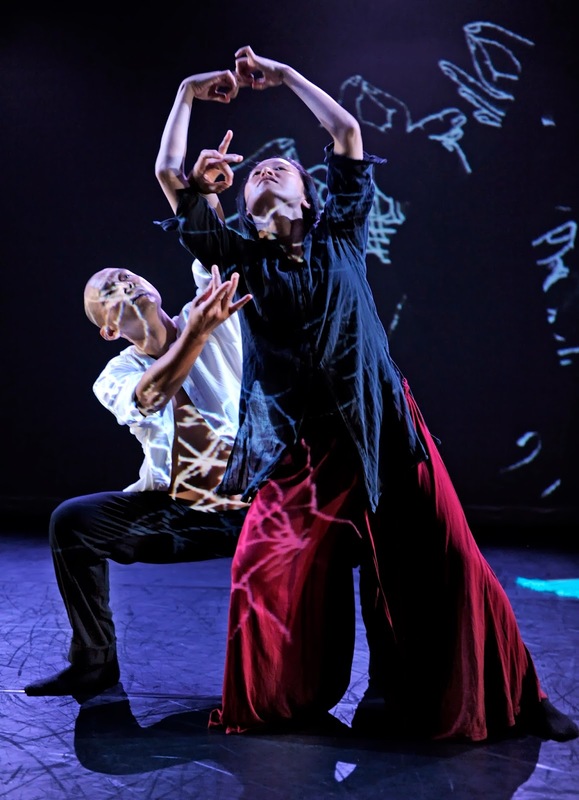 Both dancers included Chinese elements artfully within their dance; for example, Wang used chopsticks as props, which tied closely to his personal memory during The Three Year Hunger. At that time, under the authority of the Chinese Communist Party, Chairman Mao mismanaged the economy and supported radical changes in agricultural and institutional policies, which eventually led to the “three bitter years”. During this difficult time, millions of Chinese citizens died of starvation. In his solo performance, Wang used a pair of chopsticks to depict the hunger he experienced as a youth. Through the five-minute dance performance, Wang presented a one-sentence monologue “我很饿, I’m hungry” repeatedly in both Chinese and English, while he brought the empty chopsticks back and forth to his mouth and to the floor. While Wang was on his knees looking like a beggar, He stood up from her chair and played the woodblock intensively in the background. The quick successive sounds of the woodblock emphasized Wang’s desperation and hopelessness as he repeated “我很饿, I’m hungry”. It was strikingly powerful and emotional both on a personal level as well as a political level. As someone who comes from the same country but a much younger age, I was moved seeing the artist diving into his personal story. Also, how the political content was portrayed and presented on a western stage was intense and fearless. The piece was almost like a visual and aural combined biography of these creator/performers. It is not about the traditional idea of cheap products and cheap labor; rather it revealed the traditional Chinese heritage through storytelling, and explored how life paths and personal memories are shaped by early cultural experience. Sammy Chien, Qiu Xia He, Gao Yanjinzi, Wen Wei Wang. Made In China, 2015. Dance. 60mins. Chris Randle. Branigan, Tania. “China’s Great Famine: the true story.” the guardian. n.p., 1 Jan. 2013. Web. 2 March 2015. Randle, Chris. Made In China. Firehall Arts Centre, Vancouver. Wen Wei Dance. Web. 2 March 2015. Trueman, Chris. “The Cultural Revolution”. HistoryLearningSite.co.uk. 2014. Web. 12 March 2015.